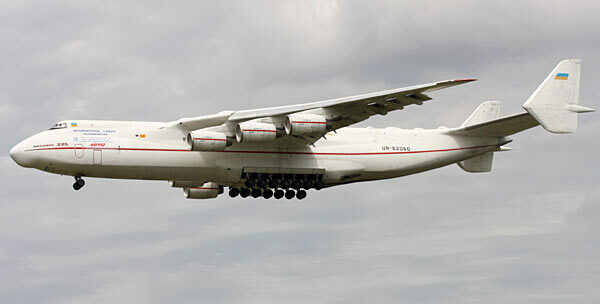 The Antonov An-225 'Mriya' (Dream) is the biggest and heaviest opeational aircraft in the world. It is actually a much enlarged version of the earlier An-124 'Ruslan' and it was developed to carry the Russian space shuttle Buran and components of the Energiya rocket on its back. 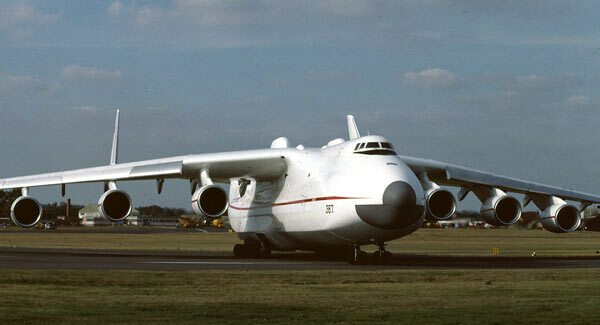 Engineers of the Antonov Design Bureau stretched the fuselage of the An-124 with about 15 meters (45 ft) and increased the wingspan also with 15 meters. They added two engines to make a total of six and redesigned the tail section with two vertical tailfins fitted at the ends of the horizontal tailplane. They also removed the rear cargo doors of the An-124, but retained the hinged nose door. The landing gear was extended with four additional pairs of wheels on the main landing gear, making a total of 32 wheels. The first flight was on 21 December 1988. However, after the collapse of the Soviet Union the Buran space shuttle program was cancelled and in 1994 the single An-225 built was grounded. It was kept in storage in Ukraine until 2000. Then Antonov revived the aircraft and upgraded it with new avionics and other new equipment. The renewed An-225 started flying again on 7 May 2001 and made its first commercial flight on 3 January 2003 from Stuttgart in Germany to Thumrait in Oman. It is operated by Antonov Airlines, the airline subidiary of the Antonov Design Bureau, as a commercial transport for outsize and heavy cargo loads. During the 1980s Antonov started the construction of a second An-225, but the work stopped in 1994. The aircraft is kept in storage, however, and Antonov considers the completion of the second aircraft if market conditions justify the investment.